Domino’s: One day we will serve pizza on Moon | UNBELIEVABLE! Don’t you just hate it when you go for a trip through space, visit planetary satellites, and can’t go for a pizza? Fear not. 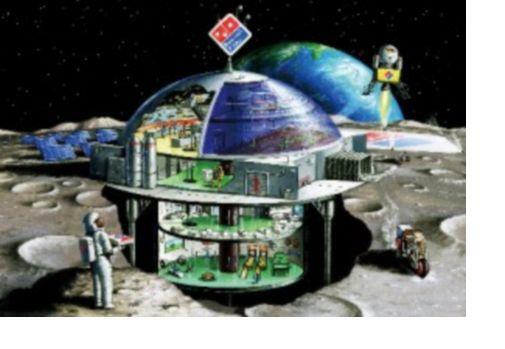 Domino’s has announced plans to become the first pizza restaurant to open on the Moon. It sounds like an April Fool’s joke, but the Japanese branch of the pizza chain is serious about constructing a two-storey, dome-shaped concrete restaurant on the Lunar surface. The company have calculated it will take 15 rockets to transport 70 tons of construction material and pizza-making equipment to the Moon, and estimate the entire project will cost Y1.67 trillion (£13.4 billion). Their reasoning behind this somewhat audacious plan is that, one day, people will be inhabiting the Moon. Tomohide Matsunaga, a spokesman for Domino’s, told the press: “In the future, we anticipate there will be many people living on the moon, astronauts who are working there and, in the future, citizens of the Moon.” Domino’s have said they first started thinking about this project last year, but admitted they have yet to decide when the restaurant will actually open. The notion of having “citizens of the Moon” may not realistically happen for decades, or even centuries; it may never happen. But if and when it does occur, at least there will be somewhere for these people to have a take-away pizza. Posted on September 3, 2011, in Cosmology, Technology and tagged Domino's, moon, Pizza, Publicity stunt. Bookmark the permalink. 1 Comment.